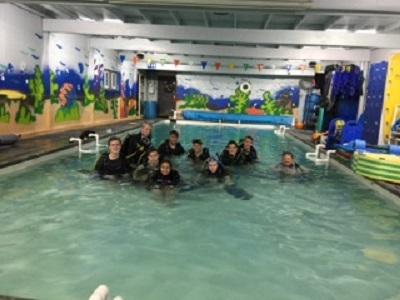 A small group of St. Anthony High School (SAHS) students became certified scuba divers earlier this month as part of a new ocean science class that offered the opportunity for the first time in the school’s 98-year history. The scuba class took place over a two-day period. 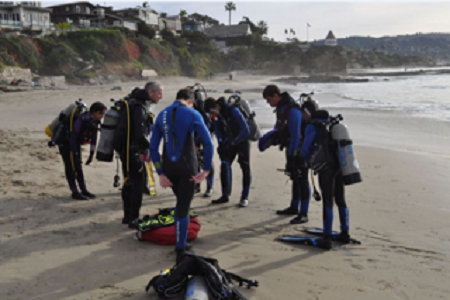 On Saturday, December 9 a group of eight students were transported via dive boat to two locations off of Catalina Island and finished their work the next day at Shaw’s Cove in Laguna where six of them were certified as open water scuba divers. Two more students are expected to become certified in the New Year, according to school officials. The opportunity was a collaboration between the high school, Deep Blue SCUBA and Swim Center in Long Beach, PADI (Professional Association of Dive Instructors) and SAHS parents. “It was an ambitious undertaking by everyone involved,” said instructor Larry Berlin in a statement. The ocean science class was proposed by Assistant Principal Dr. Jose Devera in fall 2016—an opportunity very few schools offer, school officials noted. “After several months spent putting the course together and obtaining proper accreditation, Marine Science was added to St. Anthony High School’s curriculum for the 2017-2018 school year,” a school release stated. The year-long course also incorporates STEAM, known as Science, Technology, Engineering, Arts and Mathematics as students study everything from physics to marine biology. It is open to grades 10-12 with students needing to pass Algebra 1 and biology with at least a B grade beforehand. The inaugural class currently has 16 students enrolled, Berlin said, however only eight students chose to take the SCUBA option. It is not required, nor is there a penalty or bonus for taking it. “I did encourage it, as it is a direct avenue to explore the ocean, and it is a skill they will have for a lifetime,” Berlin told the Post. One of those students who took advantage of the opportunity was junior Zoe Kennedy who will be traveling with her family to Australia over Christmas break. There she plans to dive the Great Barrier Reef.